HERE’S WHAT MAKES IT ALL WORK! This is the brilliant part! 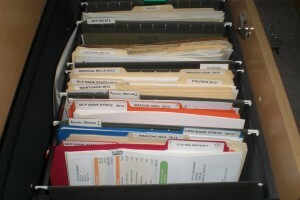 You should have file folders for the previous three years’ worth of financial records already labeled and separated by year. Make three new hanging files and make the tabs Annual Archives 1, 2 and 3. Put the dated files from three years ago in #3, from two years ago in #2, and from last year in #1. Don’t date the hanging files. Now we’ve reached the critical step that makes the whole filing system work for me. 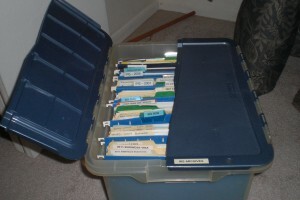 Remember the step-up/tiered file sorter that was listed in “What You’ll Need”? Time to put it to good use. 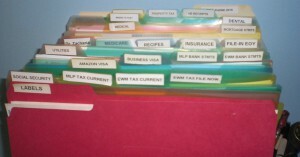 Make files for THIS year and put them in the file sorter, plus a file for the previous year’s unfiled taxes, if any. Then put the current year’s material into those files, and as new monthly statements or tax documents arrive, file them into the appropriate folder. Thus in your file sorter you’ll have “[Current Year] Bank Statements,” “[Current Year] Visa Card,” “[Current Year] Discover Card,” etc. – as appropriate for you. 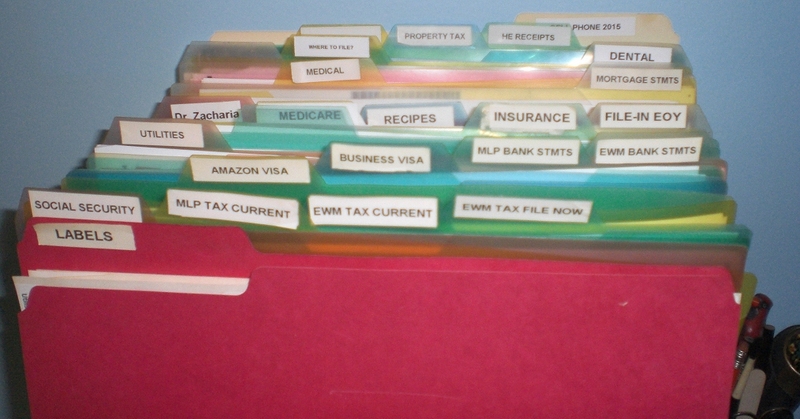 At the beginning of the new year, and until your previous year’s taxes are filed, you’d have two tax folders: One that has all the material to file for the prior year, and one to collect tax material throughout the current year, which will then stay in the sorter until your taxes are filed next year. You could also have sorter files for any non-financial papers you want to keep separated by year, like “Billy’s Report Cards First Grade,” for example. The important thing is not to put at least 85% of the current year’s papers into your file cabinets this year. 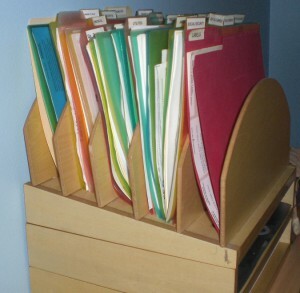 Because this way you don’t have to get into your file cabinet(s) every time a statement comes or a bill is paid. You’ll put all this material into your file cabinets at once – in January. It doesn’t have to be a tiered sorter – a flat one will work – but tiers make it easier to see everything at once. 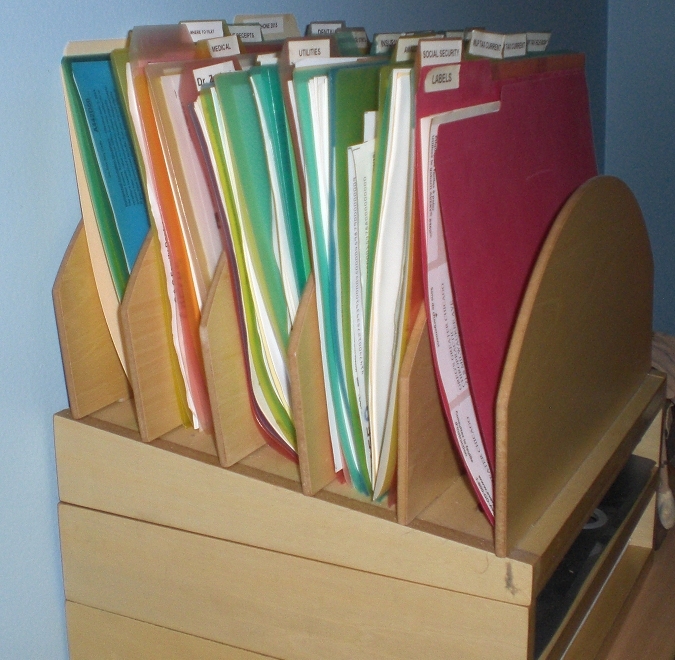 Don’t use paper trays for this unless you have absolutely no other choice, as it’s very hard to see the individual folders when they’re lying flat, making it more likely you’ll put off filing material into them. The only things from the current year you might put straight into your file cabinets could be non-tax-related individual receipts from, say, carpet cleaners, exterminators, etc. What you save is up to you, but you will need to purge these files on a yearly basis. Manuals also get filed as soon as you don’t need to refer to them frequently. And now we come to the final stage of my system solution, the step that puts it all together. 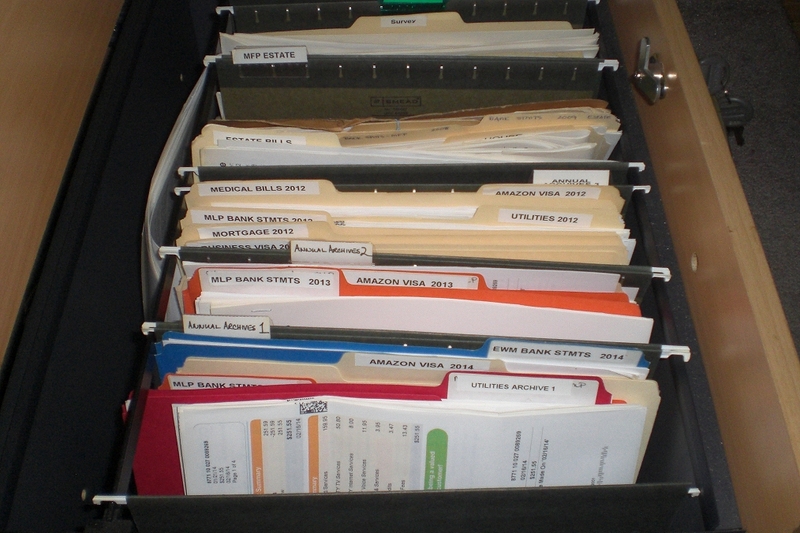 Lateral File Drawer #2 has annual archives and other important papers. Take all the material out of “Annual Archives 3.” This is now four years old. Whatever you want or need to save goes into a long-term storage container (Step 10). Move the material from “Annual Archives 2” into #3, and that from “Annual Archives 1” into #2. You will put the folder for the previous year’s taxes into the “Annual Archives 1” hanging file after you have filed your returns. Make new file folders for the sorter for what is now the current year. 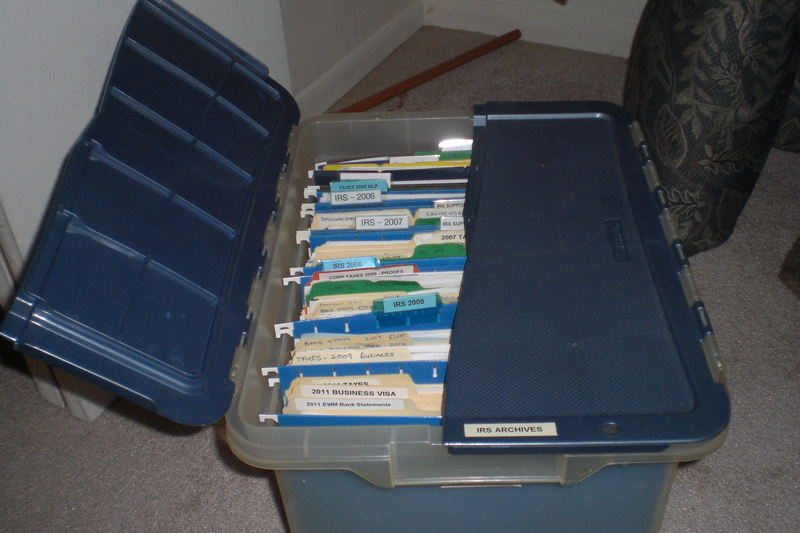 My tax filing storage tub.